After my enjoyment of the 2003 tour, I bought the tickets for most of these shows’ the moment they were announced. This tour would see me drive many miles up and down the motorways of England. I drove all the way from Coventry and I visited my mum on the way to the gig, I got to the venue and it was dark and not well sign posted admittedly I got a little lost and ended up asking someone (local) for directions it was more by luck that I spotted a truck in the venue car park thus I assumed I was in the right place. I got inside the venue and made my way to the merchandise desk, this was because the Live Album (Live Archive 03) from the previous tour was on sale and I bought it. I got chatting with a few people that I had come to know during the previous tour, I also got chatting to some fellow fans from the official Genesis website forum. I settled into my seat which was quite a way back from the stage and I waited for the gig to commence. Well this on night in particular I learned alot more about Steve Hackett’s material as he and the band played Valley of The Kings, and Hammer in the Sand both of which I never heard before now. There were a few technical hitches during the show but the band and crew had these ironed out quickly enough, Steve even made a light hearted joke about The Darkness and clearly stated that he couldn’t sing that high. Although the show ended without an encore, Steve and the band still came out to the merchandise desk to sign items and meet people as well as pose for photos. I drove home from the gig and I had to drive to a friends along the way home to pick up my ticket for the gig in Northampton and admittedly I was too tired to drive, I got onto the M40 and it was thick with fog I couldnt actually see past the end of my bonnet although this was creepy in places as I had the live album from last years tour on the car stereo. Well, I had chance to recharge my batteries and those of my camera and I set off for Northampton, again having never been here I did find my way to venue this time, there was a nice and practical car park near the venue as well. I got in and found my seat inside a very nice venue which was large too, the tour manager spotted me with my camera and came over to have a word with me (I assume along the lines of no photography) but the sound engineer interjected and vouched for me, I was most pleased and I was able to take photos as long as I didn’t use flash photography. I did manage to take some great photos, the show flew by until Blood on the rooftops when time seemed to stand still, Gary O’toole did a marvellous job singing. The interval came and went but I did leave my seat for another look at the merchandise desk, I then returned to my seat for a barn storming version of Fly on a windshield, time flew and the show ended. Steve and the band came and signed items and posed for photos by the merchandise desk. I had decided to visit family in Bolton who were happy to put me up for the night, I set off from Bolton on the A666 and I headed for Blackburn this seemed to take ages finally I arrived at the gig having got lost in and around Blackburn (Why do councils never sign post these places?) I parked my car right behind the tour minibus, and then I made my way inside, Tonight’s show was in the under croft of the venue in an area known as The Windsor Suite, it had quite a low ceiling. John Hackett was on stage tonight also he was of course playing the flute, The show flew by and it was worth the trip for those who saw it, I got some reasonable photos without getting in the way. In the interval someone asked Alan Hewitt of the fanzine TWR was he the webmaster of the Official Genesis Website? Once that was cleared up the guy in question bought some merchandise it was a nice surprise to see John Hackett’s wife on the merchandise desk also. The show was quite packed, and the second half seemed to flow better than it had done at Dartford, but alas all too soon Los Endos started and it was obvious that this gig was very soon to be over. Upon driving to this gig it started to snow, but it didn’t last long before it thawed. The venue was another nightmare to find (note: to Cambridge Council please sign post this venue better). The venue itself is brilliant for a Rock Show, and although I was getting to know the new tour manager a jobs worth from Showsec suggested that if I didn’t stop taking photos my camera would be taken from me, I was angry as they didn’t seem too interested in stopping 15 other folk from using there’s. At the interval I was later to learn that a few items I had handed to someone to pass on to the band for signing had been signed, I gave a few of these items away. The gig was fine by all standards, and there was nothing different I do recall Steve and the band coming out to meet the fans, As I was leaving the venue I noticed a camera on a tripod behind the sound desk so I assume the gig was filmed (Most likely as a reference to the director of the official DVD that was yet to be filmed in Budapest). I headed to Harlow (I got lost coming out of Cambridge thus the journey to Harlow took longer than it should have done) to stay over at my Mum’s rather than drive back to Coventry partly due to the fact I had a ticket for tomorrows show in London. I got to the gig via the Tube; I actually made my way once at Shepherds Bush to an infamous American fast food establishment and had some quick food, that over with I made my way to the venue. I was later to learn that former members of Steve’s band were in attendance from the late 70’s and early 80’s line up. There had be much mention of a special guest in the music press, of course I kind of hoped it was a former or present member of Genesis, I was moderately surprised when it happened to be John Paul Jones of Led Zeppelin. Due to the promoters requirements there was an opening band, and they were called Circus the best way to describe them was similar to Coldplay and very good at what they do, whether the audience was the right audience for them is debateable to the end of time. Soon enough the main attraction came on stage, and I had a photo pass for this show so I started snapping away and non of the photos came out that well, plus another jobs worth from Showsec made sure I left my prime spot after the third song. I had a brief chat with the tour manager during the interval and he invited me as his guest to the show in Birmingham, I gratefully accepted. I enjoyed the rest of the gig which was standing only, John Paul Jones came on stage after enjoying some of the backstage amenities and he played a lap steel guitar during Los Endos, This has since surfaced on a bootleg. I enjoyed this once in a life time line up and rendition although it was a little rough around the edges there were some folk who were cringing. Steve and the band didn’t come out to meet the fans as there was a party backstage with friends and family present, I got the tube back to Epping and headed home. Considering I live in Coventry I got into Birmingham City centre and I actually got lost (anyone see a pattern here of poorly sign posted venues? ), I finally found the venue after parking in China town. I enquired at the ticket booth and the tour manager had forgotten to reserve my ticket, I found him and reminded him of our conversation back in London, He was most apologetic and he offered me another Invite as his guest to the show in Oxford as by way of an apology. I was most grateful and said yes I’ll be there. When you consider how busy tour managers can be and how much work they have to do its no wonder that I was over looked, The guy in question was suffering from a bad case of gout as well. During the show I didn’t take many photos choosing to watch the gig instead the seating was laid out like an old cinema very relaxing, at the interval I had a chat with the Sound Engineer, and the tour manager joined us during this conversation and we were cracking jokes. The show was soon over, and I headed home after a long walk back to the car. 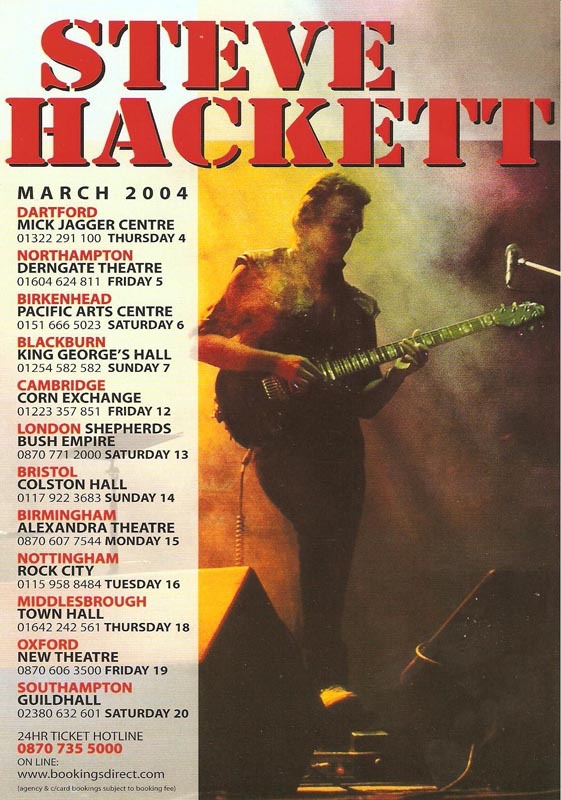 I arrived at this gig in plenty of time, and I didn’t even get lost in Oxford, I went off and got something to eat from a well know American fast food chain, on the way back I bumped into Steve and John Hackett whom had been shopping, I did say hello but I didn’t monopolise there time. I went to the ticket office, and the tour manager had forgotten, so I went around to the stage door and I managed to get a message to him, 5 minutes later he was at the ticket office with me. He apologised again and I said no problem he said Mark how can I make it up to you? I said you don’t need to really I am happy with the ticket for tonight’s show. He invited me to Southampton but I had to decline as I didn’t have the funds to travel there, I thanked him for the offer though. I got into the auditorium and I met up with the sound engineer and had a chat, him and the lighting guy kept saying I bet we’ll see you in Southampton tomorrow, I said really guys I cannot make it. I enjoyed the show and I couldn’t believe the tour was over, a really good night and a sad night not knowing when Steve would tour again. But considering the 2004 tour came about so soon after the 2003 tour that may explain why there was not a tour programme for this tour although there was a tour t shirt which I did buy one of. Before anyone writes in I actually spent over £100 on tickets and over £50 on merchandise (Another obligatory Tour T shirt amongst other items) so my gift of a single ticket for the Birmingham and Oxford gig was well earned. I would find out later on in the year that Steve was going to tour in 2005, but that’s another story. I must thank the following, Brian Coles (Tour Manager) Ben (Sound Engineer) Tigger (Lighting Engineer) the Band and of course Steve Hackett.